I spent much of the 9 hour flight looking forward to putting on my running shoes (metaphorically speaking, as I was already wearing them in fact) and exploring Seattle. Yesterday it had transpired that each of the four adults had thought that one of the other three had booked the hotel and so it seemed a miracle to have found a decent hotel right down town. A miracle it would have been - it turned out that our booking had been successful but for the month of September. For some reason that no-one seems to know, the whole of Seattle is fully booked. 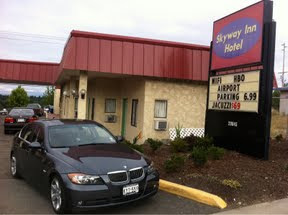 We managed to get a couple of dingy smoking rooms in one of those iconic motels, even further out of town than the airport. Add to that the sad demise of my Garmin watch - just like it's younger brother a year ago, the battery no longer retains any charge; it may have something to do with me having dropped it. The upshot is that, unless I take my iPhone (which has GPS) with me, I can't afford to get lost. I ended up running alongside the motorway that runs from the town center out to the airport; it was only at the end of my second run that I realized that there was actually a nice lake I could have run around right next to the hotel. It was interesting if not a little depressing. At the other end of the spectrum from the middle class granola eating Seattle town, one in every two restaurants was out of business succumbing, presumably, to the overwhelming pressure from the plethora of Denny's, Taco Bell and, of course, MacDonald's. What I found depressing was the quality of food that the locals had - somehow I doubted that their home cooking was any better. At one point I passed a homeless person who was asleep, sitting on a wall with a blanket draped over his head. As I ran by a tool shouted "Boo!!" from the open window of a car. I'll have to do the rest of my training without any heart rate reference. I particularly hate doing series like this because I don't know when to ease back a little nor can I have the satisfaction of knowing that I did them hard enough. It could have been worse, I suppose: there's never a good time for your Garmin to break but during a race would have been far worse.